Nuke Pro: NEST Thermostat -- Is It The Best Choice to Reduce Pollution and Save Money? NEST Thermostat -- Is It The Best Choice to Reduce Pollution and Save Money? I have expertise in energy systems, data logging. I have been running smart Thermoastats for myself since 2013. I have used only the NEST thermostat so far. I figured that as an HVAC expert and installer that NEST certainly must have great tools available for data analysis. I was wrong. 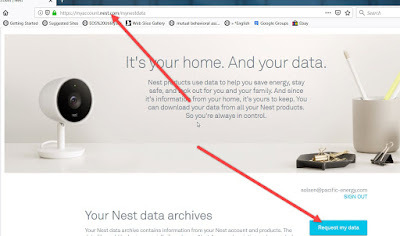 After years of thinking that I will call NEST and get their inside information or tools, I finally did today, it did take about 45 minutes to "make my point". Their customer service was "nice" but not particularly effective. I did finally ferret out the area in which you can ask NEST to email you some JSON files. Those were disappointing also. Enphase (microinverters) does much better reports.! I did find some interesting sites, that appear to help work with the data. page, and you won't even know it is there unless you scroll down. I was able to plot some interior temp data, but these are only by month. Horrible effort required to parse them all together. otherwise if you log in on this page, it just takes you to your own thermostat page. VERY frustrating!